After a period of generally increasing top-tax rates across many jurisdictions since 2008, as a response to the economic downturns seen across many countries, very few changes to the rates have been seen between 2015 and 2016. Sweden, Denmark, the USA (Federal and State taxes), the Netherlands and Belgium continue to have the highest top tax rates. The lowest of the top tax rates continue to be in Hungary, Romania, the Czech Republic, Slovakia and Poland. 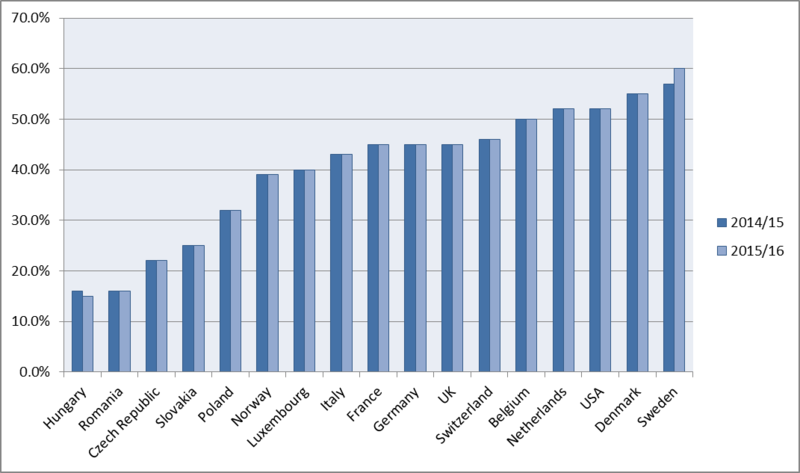 In contrast with income tax rates, the USA and Denmark have the lowest social security rates. If you have queries in relation to taxation or social security issues in any of the jurisdictions shown on the charts, please contact one of our experts in the relevant country here. For further information, please contact us on +44 (0)203 5711 or email us.